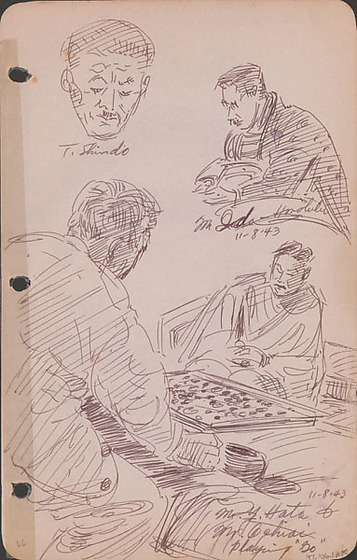 Ink sketches of two men playing Go and portraits of two men identified by inscriptions in November 8, 1943. Top left sketch of man's head with downcast eyes and mustache, identified as T.Shindo. Top right sketch of man with mustache and glasses in jacket facing left, looking down ; identified as Mr. Ida of Honolulu. Bottom sketch covering most of sheet of two men playing Go (Japanese chess) ; man on left has back to viewer and is looking at board covered with dark and light circular objects ; across the board, man on right looks down at game. Drawing 97.106.1AL is on verso of same sheet. Written in black ink, below top image left: T. Shindo. Written in black ink, below image right: Mr. Ida - Honolulu / 11-8-43. Written in black ink on bottom image, bottom right corner: 11-8-43 / Mr. Hata & / Mr. Ochiai / playing "Go." Written in pencil, bottom left corner: 66.